Pittsburgh is a confusing place; what national region it belongs to remains ambiguous, though its ethnic history runs parallel to so many other American cities from the Atlantic coast to the plains. At one time secessionists wished to call this part of the country Vandalia; during the Whiskey Rebellion they preferred the less catchy name of Westylvania. Since it was first settled by the French, then the British, and then the Americans it was a liminal point between east and west, belonging to neither. Though its reputation and its own understanding of self eventually saw it as a great industrial forge making immigrants into Americans like pig iron into steel, the truth of the matter is that people often simply recreated their home villages from Europe in the often strikingly similar topography of Pittsburgh. First came the Scots-Irish who settled this land after the Quakers of genteel Philadelphia encouraged them to the frontier and its wars that burnt like a setting sun on the western horizon. Then came the Irish Catholics, who were so resisted by the nativists that Pittsburgh (which would go on like so many other northeastern cities to be ruled by an Irish Democratic political machine) elected a Know Nothing mayor with the disreputable distinction of being the only known elected official in the world to die by being hit by a train. After the Irish came the Germans. And then the Italians. And the Poles and the hunkies, and so on and so on. Fr. Mollinger’s flock were German Catholics, distinctly different from the Pennsylvania Dutch who lived to the east. 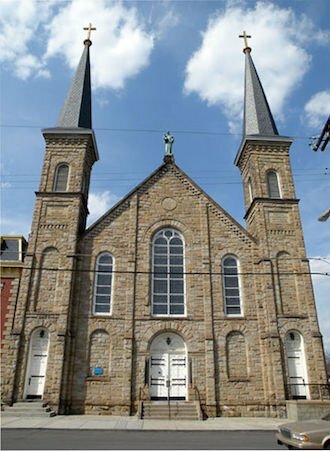 Unlike their Protestant brethren in the older parts of the state, Pittsburgh’s German Catholics huddled together in urban slums such as Troy Hill. The Germans of the nineteenth century had not yet been stripped of their identity by the tragedies of the twentieth, and like the Irish before and the Italians after they were viewed with native suspicion by those chance had made American by birth and not through choice. It was here that Fr. Mollinger – a physician by both training and inclination – gathered his congregation. The priest was a wealthy and well-educated man with a profound personal devotion to Anthony of Padua, to whom he dedicated this new church. Anthony is the patron saint of that which is lost, and cheekily enough his skull in Padua has one lost tooth that is now in Troy Hill, the first relic of many. In the rear a hill slopes gently downward into a beautiful valley, and from the porches of the residences an interesting panorama of the surrounding hills and valleys is afforded. In decided contrast is the view from the riverfront. Instead of a clear atmosphere and the bright hills covered with foliage, can be seen nothing but a huge cloud of black smoke that seems to settle continually over the city, with here and there a church spire, a smoke stack or tower projecting through the cloud. 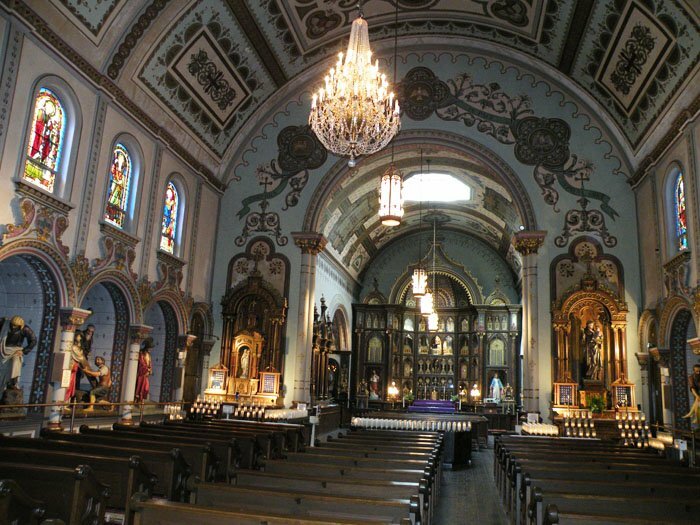 If you visit St. Anthony’s Chapel today, the front of the church, though handsome, is as regular as any other Catholic immigrant church you might see in the cities and towns of the northeast and the industrial Midwest. But inside is a sacristy sanctuary as lush and baroque as any a tourist or pilgrim would visit in Europe. 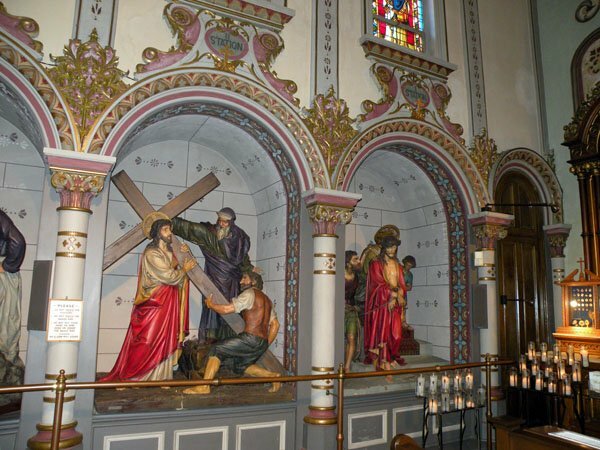 Rich violet reds and deep lush greens and celestial blues adorn fourteen carved life-size depictions of Christ’s Stations of the Cross lining the walls of the church, and in-between, in every single conceivable corner, there are relics – 5,000 of them. This is a place that seems not so much pre-Vatican II as pre-Tridentine: if you ever wished to travel to the twelfth century you only need take the 6A bus. Bits of bone, cloth, skulls, skeletons, chips of wood are all housed in ornate gem-encrusted reliquaries as if in some crusader knight’s personal temple, fresh from Jerusalem. Indeed this church contains more Roman Catholic relics than the entire Holy City; the only location with more relics is the Vatican. 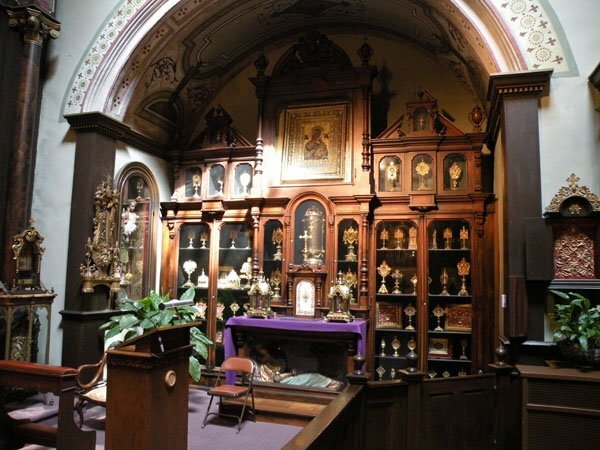 Jerusalem may be where David and Solomon built their temple, where the Ark of the Covenant once resided in the Holy of Holies, where Jesus Christ was crucified, resurrected, and ascended to heaven, but Pittsburgh has more relics. The notion of the relic triggers derision among rational-minded materialists as surely as it did Protestant reformers. Indeed, it was John Calvin who wondered if the several examples of Christ’s foreskin, the holy prepuce which multiple medieval churches claimed ownership of, indicated a miraculous size in the divine member. Nowadays, “relic” may make the modern secular reader think of nothing so much as Chaucer’s Pardoner with his collection of pig bones. But this misses the point. Relics are evidence of faith, not of prosaic reality. They are not laboratory specimens to be scientifically analyzed; they are objects that in their sacramental urgency force observers to consider the existence of divinity within the pain of everyday life. Consider the people who once sat through Mass at St. Anthony’s (and still do), men and women who had perhaps lost limbs to accident or in the many wars in which the working classes of this country have fought (and still do). Here, under the altar, stacked to the rafters, in small boxes, are slivers of physicality. An arm like your arm, a skull like your own, a body with a connection to God. People believe that relics can heal their infirmities, and whether we believe with them or not the relics remain a symbol of divinity dwelling in mere matter. Consider Annie Moore of Oil City who, though nearly blind, claimed she could see again after visiting Fr. Mollinger, or Michael O’Regon of Youngstown, whose spine was injured at work and believed that the relics of St. Anthony’s restored to him the ability to walk. This may not be the religion of the scholastics, but it is religion, and it instills in men and women the ability to hope. In a long and conflicted history, that may be one of religion’s most important gifts. Is it right to mock the faith of the father who lost his son in a mill accident? Of the mother who lost hers in war? Of people who pray for the little bit of grace that life too often withholds? Not everyone may need to believe in the miracle. But we mock at our own peril; if we deprive others of their belief, we may wind up starving our own souls. It is endlessly said that Pittsburgh is a “city of neighborhoods” (ninety at last count) but it’s more correct to say that it is a city of villages. With its rivers, mountains, and valleys it resembles no place as much as some central European province, with dozens of villages scattered across the green wooded floor (for all its Rust Belt associations Pittsburgh is if still a stunningly forested city in some parts). If one stands atop Mount Washington – from which the most clichéd (and yet beautiful) photos of the city are taken – you see a rolling carpet with these little villages hidden in hamlets behind the sparkling façade of the modern downtown. Some villages have onion-domed churches, some steeples. It is a holy city, and if not a city of dreaming spires then a city of working ones. If the essence of religion is finding the holy in the normal, the sacred in the profane, than what city could be more holy than Pittsburgh? It is a city “of brick and tired wood” where it seemed that “Christ and the Father were still fashioning the Earth” as the poet Jack Gilbert had it. It may seem like a joke to say that Pittsburgh is a holy city – but it is, in its strangeness and its savage beauty. And its holiness is multifaceted; while someone might sarcastically quip that the only real objects of faith in this city are the Steelers, it takes a special type of spiritual perception to describe a football play as the “Immaculate Reception.” The earthy nature of religion in Pittsburgh is such that there is nothing blasphemous about such a coinage – the physical and the spiritual exist in tandem here, how could it be any other way in a place so committed to production but so inhabited by the pious? Industrial Pittsburgh was the inverse of Giordano Bruno’s Naples – if the later was a paradise inhabited by demons than turn of the century Pittsburgh was a hell with the lid taken off inhabited by angels. 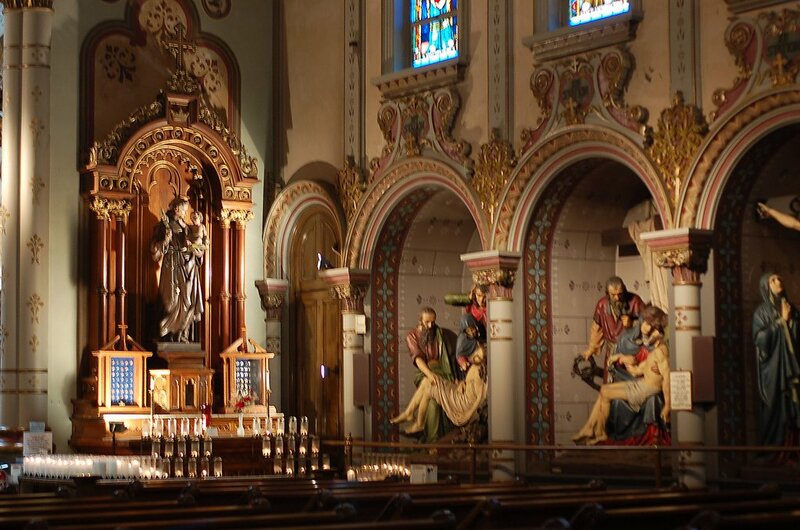 In Polish Hill there is a cathedral that is a perfect miniature of St. Peter’s in Rome. An inaccurately white-faced St. Benedict the Moor looms over Pittsburgh’s Hill District. In the northern mill town named, appropriately enough, Millville, St. Nicholas Croatian Church sits in view of the modern skyscrapers of Downtown Pittsburgh while inside are the leftish murals of the Maxo Vanko, who painted Herod as a Gilded Age capitalist and the centurions who executed Christ as Great War doughboys. Squirrel Hill is dotted with Hasidic synagogues, men davening over the Torah as if it was seventeenth century Lithuania or Galicia. In the suburb of Penn Hills sits a massive ivory colored Hindu temple, Sri Venkateswara, one of the earliest of its kind in North America, where the faithful believe an incarnation of Vishnu resides. A massive Gothic Presbyterian cathedral marks the skyline of inner-city East Liberty, looking more St. Giles than New Kirk and colloquially coined “Mellon’s fire escape” after the banker who funded it – seemingly with little knowledge of Calvinist theology. Religion is often thought of as rarefied and abstract, the metaphysical speculation of how many angels can dance on the head of a pin. But in Pittsburgh – where life was often very physical – religion had to be as well. And so we have the tired stone eyes of the Moorish saint looking out over subsidized housing, the communist paintings of Vanko, the swaying of the black hatted Hasid, and the sheer physicality of the incarnated Hindu god who resides above the Parkway East. And we have the bones and cloth of St. Anthony’s Chapel. There is an old and admittedly not-terribly-funny joke that has it God gave John Knox Scotland and threw in Pittsburgh for free. Indeed the prevalence of Presbyterian churches demonstrates the fact that Pittsburgh really is the great metropolis of the trans-Appalachian frontier, reminding us that before Tennessee was the south and Pennsylvania the north both were simply the west. And in what had once been the burnt-over country of the second Great Awakening the physicality of that frontier religion remains, and though John Knox would be revolted to hear it, that type of physical faith still exists in the Catholics, Jews, Hindus and so on who adopted this place as their new home. In many ways they all had more in common than they would have ever expected. It’s an earthy city, and regardless of theology the religion that is practiced there is going to be the same. During the last 500 years, besieged both by Cartesian rationalism and Luther’s Reformation, civilization attempted to distance us from the sacred, or even to abolish it in some sense. A disenchantment of the world, as the sociologists would put it. The sacred and the profane and the holy and the physical were to be separated. Yet in Catholicism – especially medieval Catholicism – mankind may be fallen but the world is still God’s creation. And the brilliance of medieval Catholicism is that sparks of the divine could exist within corporeal reality. It is the incarnational logic that has it that if God could become man, than simple objects can also be holy. The saints serve to remind us that holiness exists within creation. If modernity’s primary instincts were to separate the two cities of God, our present one and the one to come, than St. Anthony’s is itself a blessed relic of the past. The cynic may decry this as pre-modern superstition, but faith is not faith because it is respectable, it is such because the lived experience of it is real. The beauty of this understanding is that one can believe in the sacred even if you don’t believe in God, you can acknowledge these things of the saints even if you are not one yourself. Sacredness is an experience, not a worldview, and it is accessible to the pious and apostate alike. St. Anthony’s does what it has always done, providing a continuity of belief from the Gilded Age till today. When it was built the working class were sacrificed on Frick and Carnegie’s altar of capital. Today the gap between those of the Kingdom of God and the others who find it harder to enter that Kingdom than to fit through a needle’s eye again find the gulf separating each other almost insurmountable. They no longer make ketchup and vinegar in the Heinz factory; the building is now condos, and the mills have been silent for a generation. The New York Times seemingly discovers this city every month with some article declaring it the new Williamsburg or the new Portland, this place of aching beauty, with its ancient hills and rivers that will remain long after the last person is gone. And despite it all St. Anthony’s goes on, the pilgrims come day after day looking for a cure to whatever causes them suffering, a respite from whatever haunts them. It’s the humanity that is beautiful. So what does St. Anthony’s teach us? What does it teach us especially if we are not really the faithful, or sometimes the faithful, or wish we could be the faithful, or even never could be the faithful? It teaches us that no matter the pain – illness, poverty, death – there is nobility in our bodies. That the soul may be holy but that the body can be as well. That the saints may have been otherworldly but that they also had hands that were held, lips that were kissed, tongues which spoke, feet that walked, eyes that saw, ears that heard. That the back, which aches from labor, or the feet calloused from travel are not so dissimilar to those which belonged to God’s favorites. The saints were all born, all lived, they ate, drank, defecated, slept, loved, and died, just like you do and you will. Nothing is sacred without the profane, that’s the fundamental rule of faith, which cannot be forgotten if faith is to remain faith. It is after all our bodies that connect us. A half millennium of modernity has tried to make religion respectable, but if it is respectable it’s not really faith. That is to say that faith must always be Other, it must be visceral, lived, experienced, sensory, seen, felt, tasted, smelled, touched and listened to before it is every merely believed. Religion isn’t just in the head or the heart, it’s in the body, and the relics remind us of that. A religion exorcized of its strangeness is scarcely religion. St. Anthony’s welcomes the pilgrim searching for real religion. Ed Simon is a Ph.D. candidate in the English department of Lehigh University. His research focuses on religion and literature in the seventeenth- and eighteenth-century Atlantic world. He has been previously published in Salon, Quartz, Religion Dispatches, The Revealer, Killing the Buddha, the Journal of the Northern Renaissance, and the Public Domain Review among others. Currently he is the assistant editor of the Journal of Heresy Studies, and one of the founding members of the International Society for Heresy Studies. He can be followed on Twitter @WithEdSimon. Thank you for this thoughtful reflection on one of Pittsburgh’s treasures. I am Fr. Jim Orr, the Pastor of Most Holy Name of Jesus Parish of which St. Anthony Chapel is a ministry. I appreciate the reflection you have made concerning the Chapel. I do note a few things that need correction. 1) A Sacristy is the room where vesting happens and the various vessels and such are stored for use in the Church proper. You were probably looking for the word Sanctuary which Protestant denominations use to describe the interior of a Church. 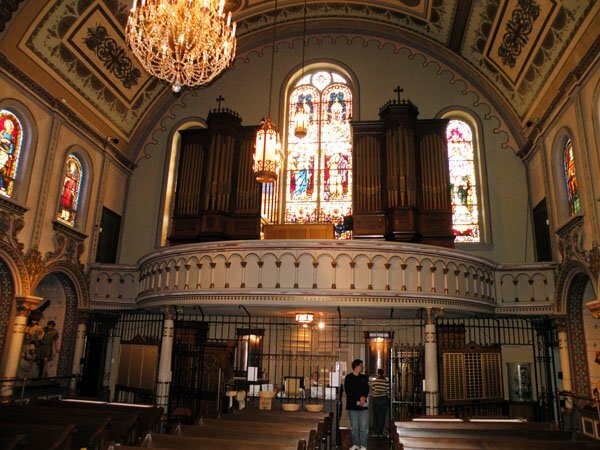 In Catholic usage, the interior of a Church is in three parts The Narthex or vestibule just inside the doors of the Church; the nave which is the part in which one finds the pews and the Sanctuary which in the chapel is behind the Communion Rail. In most modern Catholic Churches is the area that holds the Ambo ( Pulpit), Altar, Crucifix and the Presidential Chair. It may also include additional statuary and yes relics. The sacristy is not formally considered a part of the Church. Second. I am only aware of one purported relic of Jesus foreskin. It was confiscated by the Vatican in medieval times and dumped into the deepest known part of the Mediterranean Sea. If any other such existed, the local bishops would have taken the hint. Third. Fr. Mollinger died of Dropsy as it was called at the time. It was an accumulation of fluids in the body and death was most likely by congestive heart failure, not heat exhaustion. Fourth, Troy Hill is not a slum. That characterization is an insult. As a matter of fact the area is undergoing “gentrification.” This has been a family by family project but very real. The local small business district is being revitalized with a restaurant, Coffee Shop and Bakery. Most of my parishioners live in Troy Hill and take good care of their properties. A real estate developer has on his plans to buy properties as they become available for his projects. Thank you for your comments and corrections. I apologize for the characterization of the area as a slum – I didn’t mean that it currently was (I know Troy Hill as a very nice area), but was rather referring to the living conditions that working class immigrants were forced to live in at the end of the nineteenth century. It’s my fault if that was not clearer. Please accept my apology for any insult taken – the piece was meant as a reflection on the intense spirituality I associate with St. Anthony’s. Dear Fr. Orr: Thanks so much for your notes; I’ve amended the article to correct the first two points. As to the third, I defer to the author’s knowledge of his subject matter. 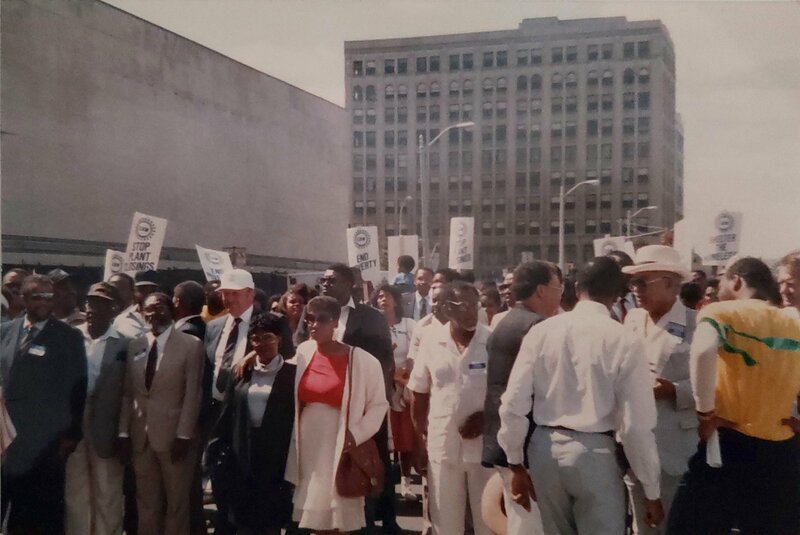 And as to the fourth, I do think that to characterize Troy Hill as a “slum” in the early days of Pittsburgh industry is, in fact, accurate — while it is pejorative, the author is clearly speaking historically, not of the present-day neighborhood. Many thanks again for taking the time to write! Dear Father Orr, thank you for your comments. I hope to visit Most Holy Name soon, I grew up there, was Baptized, and made my First Communion in your beautiful Church. The Pope said everyone should make a pilgrimage to the Church where they were Baptized, I plan on it. a few years ago, I drove my Mother up to Saint Anthony Chapel so she could see it before she died (we live in Greensburg, she had a very bad cancer) My prayer group from the Blessed Sacrament Cathedral plan on making a pilgrimage to your beautiful soon. I love Troy Hill. Most Holy Name and Troy Hill. I made me what I am today. I hope to attend Mass as soon as possible and hope to meet you or at least attend your Mass.